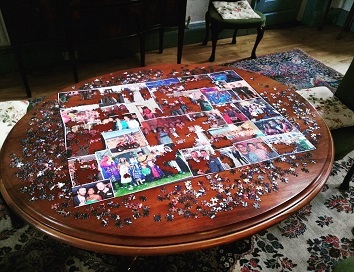 The Challenge: a 2000 piece jigsaw puzzle to be completed over a 3 day stay by a group of 23 friends celebrating a 40th birthday. No picture for reference allowed. The last piece was entered at 12 o’clock (check-out time) on the 3rd day. Success!! Happy Birthday Andrew. We loved hosting your party and getting to know your great bunch of friends! Spend enough time anywhere and it will become normal. When I first arrived in Ireland from Canada in 1998, I savoured every small, alien detail. The smell of turf, the sideways spray of inoffensive mist, the never-ending hedgerows, the random banter. Necessarily, the magic fades. Seeing everything as if for the first time would be exhausting. However, it is nice every now and again to be reminded of it. People from around the world arrive at our door because they chose Ireland, chose our house, have chosen to drink it all in and I get to be their drinkin’ buddy, so to speak. Our home is temporarily theirs as they head off on their “Irish Adventure”. When they return I get to hear stories set in my world, told through their eyes and both their eyes and their stories are better than mine. They often see beauty where I see the ordinary and have great adventures from unlikely beginnings. Old Man: Who are you? Old Man: Where are you staying? Old Man: Do you have a cigarette? Barbara: No, sorry. I didn’t think to bring them when I came jogging this morning. Old Man: I have a house for sale down the road. Do you want to buy a house? Barbara: No thank you. I’m just visiting. That was it. He walked on, she jogged. To think that if Barbara hadn’t gotten up that morning to seize the day and to welcome all that Ireland had to offer, the opportunity would have been lost and that beautifully surreal conversation would never have taken place. I’m sure she enjoyed the historic sites that I sent her to and the pubs that I recommended, but you can be sure that by the time you’ve read this, the story about the old man trying to sell her his house is the one she has shared with family and friends at dinner parties and bars back home. 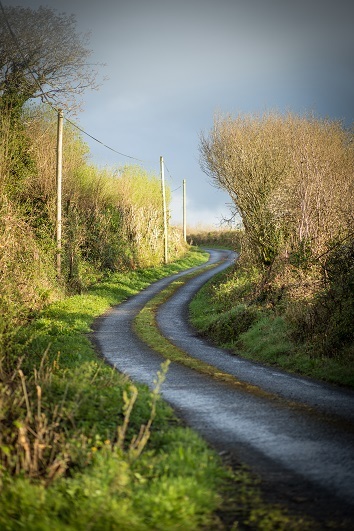 Indeed, it is encounters such as these at the side of country roads that do more to excite the imagination of visitors to Ireland than any glossy travel brochure. The brochure shows you the stage, but the experiences are the play. And although I try my best to point visitors towards experiences that I think will enhance their stay, it is often the ones that they stumble upon themselves that stay with them the longest and remind me that there is great stuff everywhere, if you look. And a graveyard is as good a place as any to start looking. So, my advice for visitors to these shores; come to Ireland and get lost… You never know what you might find.